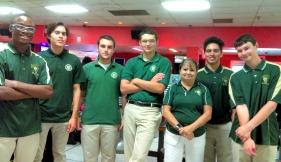 Hustler Bowling Teams on a Roll! 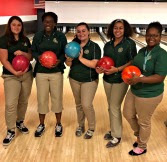 Congratulations to MCC&apos;s Girls&apos; Varsity Bowling team of seniors: Ayla, Laquanna, Natalie, and Rayah, and freshman Sarah! On August 29, the girls defeated Melbourne High School with a 6-1 match point win at Harbour Lanes. On September 4 at Harbour Lanes, the boys&apos; team split with Satellite High School going 2-5 with Josh M. rolling his high game of 142 while he and Ethan G. matched pin for pin with their Satellite counterparts in a roll off during the ninth and tenth frames of the second Baker game. Awesome job, Hustlers!